Production of the Cruze in the United States and Mexico ended in 2019, while the car is still produced and sold in other markets worldwide. Before the release of the global Chevrolet Cruze compact sedan in 2008, General Motors made use of the name "Cruze" between 2001 and 2008 in Japan. Announced as the Chevrolet YGM1 concept car at the Tokyo Motor Show in 1999, the original Cruze was derived from the subcompact Suzuki Ignis five-door hatchback (known as the Suzuki Swift in Japan). Despite the Chevrolet branding, the YGM1, like the production car, was the work of GM's Australian arm, Holden. Along with the styling, Holden executed most of the engineering work and were responsible for devising the "Cruze" nameplate. The Cruze came either with a 1.3- or 1.5-liter engine coupled to either five-speed manual or four-speed automatic transmissions. Manufactured by Suzuki in Japan, GM revealed the production Chevrolet Cruze in October 2001, with Japanese sales commencing the following month. From 2002 through to 2006 this generation of Cruze was sold in Australia and New Zealand. In New Zealand this generation Cruze was sold as the Chevrolet Cruze. The production Cruze had standard front-wheel drive, with all-wheel drive optional. Chevrolet pursued a marketing strategy that positioned the high-riding Cruze as a light-duty sport utility vehicle (SUV). This contrasted with Suzuki's approach with the Ignis marketed as a conventional passenger model. From 2003, Suzuki of Europe began manufacturing the Cruze as the Suzuki Ignis—representing a facelift of the original Ignis, but only for European markets. In 2008, GM introduced the Cruze compact car, carrying the "J300" internal designation. This J300 iteration serves as a replacement for the Chevrolet Cobalt, Daewoo Lacetti and Holden Astra—all unrelated cars. GM phased out production of the Cobalt and its badge engineered counterpart, the Pontiac G5 in 2010, just prior to the manufacturing of the Chevrolet Cruze was to commence. The first renderings of the Cruze were revealed by GM at a press conference on July 15, 2008, with the first official images released on August 21, 2008. Cruze production sites include Gunsan, Jeonbuk, South Korea; Saint Petersburg, Russia; Shenyang, China; and Halol, India; Hanoi, Vietnam since April 2010 in complete knock-down (CKD) form, Ust-Kamenogorsk, Kazakhstan from May 2010; Rayong, Thailand after December 2010, and São Caetano do Sul, Brazil from 2011. Holden's localized hatchback version of the Cruze built at the Elizabeth, South Australia factory from late 2011 joined the Cruze sedan manufactured there since March 2011. GM in the United States has upgraded the existing plant in Lordstown, Ohio to manufacture the Cruze, investing more than US$350 million. At the ceremony of the start of production of Cruze at Ohio, Mark Reuss, the president of GM's North American operations said, "This is everything for us". It is described as GM's most significant new vehicle introduction into North America since the Chapter 11 reorganization in 2009, and is GM's latest attempt to build a small size car that North American consumers would "buy because they like it – not simply because it is cheap". Underpinned by the front-wheel drive GM Delta II platform, GM has confirmed the Cruze development program occurred under a global design and engineering team. GM Daewoo in South Korea played a leading role in the design and engineering of the Cruze, along with GM's German-based Opel division. This development program spanned over 27 months at a cost of US$4 billion. A total of 221 prototypes were tested in Australia, Canada, China, South Korea, Sweden, the United Kingdom and the United States. According to GM, the Cruze's body structure is 65 percent high-strength steel. MacPherson struts are utilized in the front suspension with a solid torsion beam axle for the rear, avoiding the cost and complexity needed for a modern multi-link independent rear suspension used by some more expensive rivals. According to GM's global product development chief Mark Reuss, the North America version Cruze is modified from the global platform as it requires reinforcements to the engine compartment because it offers a bigger engine than in other markets and uses torsion beam suspension. Hydraulically-assisted (electric for North American market) rack and pinion steering gives for a 10.9-meter (36 ft) turning circle. Braking-wise, ventilated front, and solid rear disc brakes are employed, both using piston steel calipers. To counteract noise, vibration, and harshness, engineers have designed the Cruze with an isolated four-point engine mount and implemented sound damping material in areas including the front-of-dashboard panel, luggage compartment, decklid internals, doors, carpet and headlining. Further noise suppression through the use of a triple-layer sealing system in the doors has also been employed. A five-door Cruze hatchback was unveiled as a concept car at the 2010 Paris Motor Show on October 1, 2010. Cruze hatchback sales began in Europe in mid-2011. Holden in Australia were responsible for the design and development of the hatchback body variant. GM unveiled the Chevrolet Cruze station wagon in February 2012 at the Geneva Motor Show. Load space ranges from about 500 litres (20 cu ft) up to the window line in the rear, to nearly 1,500 litres (50 cu ft) up to the roof top with the rear seats folded down. The Australasian New Car Assessment Program (ANCAP) announced in May 2009 that it has awarded the Cruze a full five stars in their independent crash safety test, with 35.04 out of a possible 37 points. The following July, the China New Car Assessment Program (C-NCAP) awarded the Cruze a maximum five stars in their independent crash safety test. The Cruze SE 1.6-liter tested scored a maximum of 16 points in side-impact collision, 14.44 in front-end collision, and 15.73 in the 40 percent frontal offset collision. Euro NCAP released its rating in November, with the Chevrolet Cruze again receiving the full five-star grading. While the Cruze scored 96 percent for adult protection, and 84 percent for child occupant protection, Euro NCAP's figure for pedestrian protection is quoted at significantly lower 34 percent. In December 2009, the South Korean-specification Cruze—the Daewoo Lacetti Premiere—received the top rating of five stars from the Korean New Car Assessment Program (KNCAP). According to KNCAP, the Lacetti Premiere received the five-star rating in the frontal, offset frontal, side, and whiplash tests. In the United States, the Cruze received the highest possible ratings of "good" in front, side, rear and rollover crash protection tests by the Insurance Institute for Highway Safety (IIHS), which has recognized the Cruze as a 2011 Top Safety Pick. Moreover, The National Highway Traffic Safety Administration (NHTSA) has awarded the Cruze its highest five-star rating for safety. The score is broken down into maximum five-star results for frontal impact (driver and passenger), side impact (driver and passenger), and for the side pole test (driver). The NHTSA certified the Cruze's rollover rating at four out of five stars. GM announced in April 2011 that 2,100 North American-market Cruze models would be recalled following a report of the steering wheel breaking away from the steering column during motion. According to Consumer Reports, during its first year, the Cruze scored the lowest in reliability among compact sedans. General Motors ordered a recall on June 22, 2012, for 413,418 Cruze models, manufactured at the Lordstown, Ohio plant United States, due to a risk of engine compartment fires. The recall covered 2011 and 2012 model year Cruze sedans from September 2010 through May 2012 and affected vehicles sold in the United States, Canada and Israel. The problem can result when liquids become trapped near the engine and catch fire. In Australia 9,547 Australian-built Cruzes were also recalled but there were no cases of engine fires reported in Australia. General Motors (GM) ordered a recall on August 16, 2013, for 292,879 model year 2011 and 2012 Cruze models, manufactured at the Lordstown, Ohio plant United States. General Motors told the National Highway Traffic Safety Administration the recall was due to a potential intermittent loss of brake assist in Cruze models featuring the combination of the 1.4-liter dual overhead cam gasoline turbo engine and the 6T40 FWD automatic transmission. GM said it was aware of 27 alleged low-speed crashes due to brake issues that may include this particular issue, but it reported no injuries. To address the issue, GM said dealers will replace a micro-switch in the power brake vacuum pipe assembly. As of March 28, 2014, GM has halted the sale of 2013 and 2014 Chevrolet Cruze compacts with 1.4-liter engines—models that account for about 60% of Cruze sales—but GM originally didn't say why it issued the order. GM later announced that the cars were being recalled due to a faulty right-side axle shaft. The Cruze was given a mild facelift for 2013 and unveiled by GM at the 2012 Busan Motor Show, South Korea. The Cruze received an updated front fascia, with the air vents around the foglamps being redesigned entirely, and the grille and headlights also receiving minor updates. New alloy wheels have also been designed for the Cruze. GM's optional MyLink entertainment system is now offered as well. This model was first sold in Korea, then Malaysia. It will be later sold in other markets. On April 12, 2014, Chevrolet announced that it would unveil a refreshed Chevrolet Cruze at the 2014 New York Auto Show as a 2015 model, with an updated grille and a more angular shape from the Malibu. For the Asian version, the rear end was completely restyled with new lamps, trunk lid, and rear bumper. The Chinese version of the facelift shares the same rear end design, but has an exclusive redesigned front end also featuring new front lamps. Engines fitted to the Cruze are the 1.6-liter Family 1 inline-four, a 1.8-liter version of the same, and a 2.0-liter VM Motori RA 420 SOHC turbocharged common rail diesel, marketed as VCDi. All three engines are coupled to a five-speed manual or optional six-speed automatic transmission featuring Active Select. When the Cruze launched in the United States in 2010, a new 1.4-liter Family 0 turbocharged gasoline engine was introduced. North American models fitted with the 1.8-liter gasoline engine have also been upgraded to a standard six-speed manual. In 2011, a new 2.0-liter Family Z diesel engine marketed as VCDi replaced the previous VM Motori VCDi unit of equal displacement. Since late 2011, Chinese market models have been available with a turbocharged 1.6-liter engine with a six-speed manual transmission. The Chevrolet Cruze was launched in the Egyptian market during mid-2009. South African sales of the Cruze commenced in September 2009. South Korean-market versions of the Cruze entered production there in 2008 as the "Daewoo Lacetti Premiere". The Lacetti debuted on October 30, 2008, featuring the 1.6-liter naturally aspirated engine. On January 30, 2009, GM Daewoo introduced the turbodiesel engine variant. Inline with the February 2011 renaming of "GM Daewoo" to "GM Korea", the Lacetti Premiere adopted the international "Chevrolet Cruze" name from March 2, 2011. For the owners of the previous model, Lacetti, GM Korea decided to replace the old emblem to that of Chevrolet for free. The Chevrolet Cruze was launched in the Chinese market on April 18, 2009 as a sedan manufactured at GM India's Halol factory. Transmission choices were a five-speed manual or a six-speed automatic along with 1.6- or 1.8-liter engines. The sedan range consisted of the 1.6 SL, 1.6 SE, 1.8 SE (automatic only) and 1.8 SX (automatic only). Hatchback models were introduced in 2013 available with the 1.6-liter or 1.6-liter turbo engines. The Chevrolet Cruze was released in India on October 12, 2009. It was offered in only two versions: LT and LTZ in diesel form only (VCDi). During 2009, there were reports that the Cruze was to become available in Malaysia with the 1.6 and a 1.8-liter engines. The Naza automotive group in Malaysia has announced that it's expecting to launch the Cruze in the Malaysian market for the first time in the second quarter of 2010 and they are expecting to sell 1,200 to 1,500 units in 2010. In Thailand, the car launch in December 2010, built at GM's Rayong facility. Specification levels comprised: Base (1.6-liter), LS (1.6- and 1.8-liter), LT and LTZ (1.8-liter), 6-speed automatic are standard in all models except 1.6 Base used 5-speed manual, with an optional 2.0-liter VCDi available on LTZ variant with 6-speed automatic. The Australian arm of GM, Holden, announced at the Melbourne International Motor Show on February 27, 2009 that sales of the South Korean-produced Cruze would begin under the Holden brand. Replacing the Holden Viva, the Cruze reached dealerships on June 1. The Cruze also became the replacement for the Holden Astra, dropped from the Holden lineup the following August. Given the model designation JG, the Holden Cruze was launched with the 1.8-liter petrol engine and optional 2.0-liter turbodiesel. Both engines are mated to the five-speed manual transmission or optional six-speed automatic. Electronic stability control (ESC), seat belt pretensioners and six airbags were standard fitment across the range. Specification-wise, the "CD" opened up the range, finished off with a more upmarket "CDX". The "CD" equipment list comprised 16-inch steel wheels, air conditioning, cruise control, a trip computer, power windows and automatic headlamps. "CDX" versions add 17-inch alloy wheels, front fog lamps, a leather-wrapped steering wheel and upholstery, heated front seats and rear parking sensors. Initially a petrol-only model, diesel availability was expanded to the "CDX" trim in early 2010. On March 18, 2010, Holden issued a recall for 9,098 petrol-engined 2010 model year Cruzes in Australia and a further 485 in New Zealand over a faulty fuel hose. According to Holden, some hoses on 1.8-liter cars had developed a leakage, although no accidents or injuries had been reported prior to the recall. The recall followed a stop-delivery notice issued by Holden to its dealers on March 3 while the automaker conducted an investigation into the matter. Holden announced on December 22, 2008 that its Elizabeth, South Australia production line would be split to commence local production of the Cruze sedan and the Australian-developed hatchback. Production was originally scheduled to start by September 2010. However, it was confirmed in January 2010 that production would in fact begin in March 2011. The announcement to assemble the car came as a response to the slowing sales of the larger, locally produced Holden Commodore range. The Australian Government committed A$149 million to the program from its $6.2 billion Green Car Innovation Fund, with a further $30 million given by the State Government of South Australia. GM Holden matched both amounts, but the then chairman and managing director Mark Reuss would not reveal Holden's total investment. Reuss announced his firm would be considering the utilization of liquid petroleum gas (LPG), compressed natural gas (CNG), ethanol (E85) flexible-fuel and petrol/electric hybrid start-stop system powertrain technologies. These technologies, if materialized, would supplement the four-cylinder petrol and diesel powertrain offerings already confirmed by Holden at the time of the announcement. At a media event on February 28, 2011, Holden unveiled the Australian assembled Cruze sedan in facelifted "Series II" guise, otherwise known as the JH series. Prime Minister Julia Gillard attended the February launch to drive the first example off Holden's production line before full-scale production commenced in March. Holden has confirmed an initial local content level of between 40 and 50 percent if assessed by retail value, with an aim of increasing Cruze localization over time. Series II styling revisions to the grille, lower air intake, and bumper have softened the front-end to bear a closer resemblance to Holden's larger VE II Commodore. Further differentiation from the original has been achieved via the fitment of amber front indicator lights, jewelled bezel headlamps, remodelled wheel trims, and through adjustments to the lower portion of the rear bumper. Carrying over largely unchanged is the 1.8-liter petrol inline-four, tweaked to yield slight enhancements in drivability. When automatic transmission is specified, the 1.8-liter is now teamed with GM's six-speed 6T30 unit, lighter and more compact than the previous 6T40. Diesel remains optional for "CD" and "CDX" specifications over the standard 1.8-liter petrol. Alterations to the 2.0-liter turbodiesel have resulted in an additional 10 kilowatts (13 hp) and 40 newton metres (30 lb⋅ft) and a slight reduction in fuel consumption for the manual variant, now a six-speed unit. However, the headline change is the release of the turbocharged 1.4-liter engine, dubbed iTi by Holden for intelligent turbo induction. The inclusion of the 1.4 also brings an upgrade to electric (as opposed to hydraulic) power steering and affixes a Watt's linkage to the torsion beam rear suspension. Linked with six-speed manual or automatic transmissions, the 1.4 is fitted as standard to the new "SRi" and "SRi-V" sports-oriented trims, but is available at extra cost on the base "CD". The new "SRi" and "SRi-V" models have their respective badges embossed onto the grille insert, are fitted with their own front bumper design, and feature side skirts, chrome exterior door handles, a rear lip spoiler, and five-spoke 17-inch alloy wheels. Over the "CD", "SRi" gains a leather-covered steering wheel rim and shift lever, with the "SRi-V" extending this upholstering to the seating. A heat function for the front seats, keyless entry with push-button engine start, reversing sensors, and seven-inch LCD multimedia unit are also part of the "SRi-V" equipment list. This multimedia system integrates satellite navigation, the CD and DVD players, and a 10 GB internal hard disk drive. In mid-November 2011, Holden released the MY12 update to the Series II Cruze. This update coincided with the release of the hatchback body variant and saw Bluetooth telephone connectivity standard across the range. In April 2013 the Series II Cruze received an update and price drops. The update included rear-parking sensors, a 7-inch touch-screen, suspension adjustments and improved automatic gearboxes across the range along with many other new extras such as a larger 1.6-liter turbocharged engine as standard on the SRi and SRi-V, replacing the 1.4-liter turbo. Holden ended manufacturing of the Cruze at its Elizabeth plant on October 7, 2016, replaced by the Astra hatchback and new generation Cruze sedan—both imported. European specification variants of the Cruze are offered with 1.6- and 1.8-litre petrol engines, and 2.0-litre and (from 2012) 1.7-litre diesel engines. In mid-2011, with the arrival of the five-door hatchback variant, the 1.6-litre petrol engine received an upgrade from 113 bhp to 122 bhp. Exports from the South Korean factory began on February 24, 2009. Mexico became the first North American country to receive the car, going on sale for the 2010 model year in late 2009. Imported from South Korea, the Chevrolet Cruze in Mexico replaces both the Chevrolet Astra (last sold in 2008) and Optra as the compact offering there. The US and Canadian version of the Chevrolet Cruze entered limited production at Lordstown, Ohio, in July 2010 as a 2011 model, replacing the Chevrolet Cobalt. Full production began September 8, 2010. For these markets, the Cruze utilizes a more advanced Watts Z-link rear suspension from the Opel Astra (J). Offered in LS, LT, LTZ, and Eco trim lines, both the 1.8-liter and the turbocharged 1.4-liter engines are offered, coupled with either a six-speed manual or automatic transmission. With a starting price slightly higher than most compact competitors, the base model Cruze LS is equipped with the 1.8-liter gasoline engine and comes with air-conditioning and power locks, the higher-level LT and LTZ models is fitted with the 1.4-liter turbocharged gasoline engine. For the Eco model, aerodynamic improvements have been made such as an electronically controlled air shutter that adjusts air flow to the engine depending on the temperature, wind speed and tow weight. To save weight, Chevrolet replaces the space saving spare tire and jack on the Eco model with a tire inflator kit, reducing weight by 12 kilograms (26 lb). Standard safety equipment includes electronic stability control and ten airbags, including side rear-seat and front knee airbags not fitted on models produced in the original South Korea facility. The Cobalt's badge engineered twin, the Pontiac G5, has not been replaced by a Cruze-based equivalent, due to the Pontiac brand being phased out during 2010. The Cruze is built on the production lines that were used to build the Cobalt and Pontiac G5 in Lordstown, Ohio. Cobalt production ended in June 2010 and the Cruze started production in July 2010. GM has allocated three shifts to produce the Cruze and it arrived to dealers in September 2010, giving all dealers time to deplete their inventories of Cobalts. Changes to the North American-built Cruze for model year 2012 include the availability of the six-speed manual transmission for the 1.4-litre turbocharged engine, plus models not equipped with power front seats no longer have the front seat cushion tilt option. Starting with the 2014 model year, Chevrolet offered the Cruze with the clean diesel engine option for North America. With a starting price of $25,695, the Cruze diesel 2.0-liter Multijet engine got 44 mpg on the highway and 27 mpg in the city, while producing 148 hp (110 kW) and 258 lb⋅ft (350 N⋅m), mated to a six-speed automatic transmission. The 2014 Chevy Cruze Clean Turbo Diesel, direct from the factory, will be rated for up to B20 (blend of 20% biodiesel / 80% regular diesel) biodiesel compatibility. The Cruze diesel was the first GM passenger car in the US equipped with a diesel engine in 28 years, however sales were weaker than expected with 2% of US models. For 2016, the first generation Cruze continued as a fleet and rental exclusive model in the United States, billed as Cruze Limited. The diesel model was discontinued, but a new chrome appearance package was offered. L : The L, introduced in 2015, was positioned below the previously-base LS. Offering identical standard equipment as the LS described below, the base L omitted the standard front and rear carpeted floor mats that were standard equipment on the LS, and was only offered with a six-speed manual transmission. LS: Between 2011 and 2014, the LS was the base Cruze trim level, until the base L was added in 2015. Standard features of the LS included fifteen-inch black-painted steel wheels with full wheel covers, air conditioning, power windows and door locks, keyless entry, premium cloth seating surfaces, dual manually-adjustable front bucket seats, an A/M-F/M stereo with single-disc CD/MP3 player and auxiliary audio input jack with a six-speaker audio system, front and rear carpeted floor mats, tilt-and-telescopic vinyl-wrapped steering wheel with integrated audio system controls, a 1.8L EcoTec Inline Four-Cylinder (I4) gasoline engine, a six-speed manual transmission, and a split-folding rear bench seat. Options included Bluetooth for hands-free telephone calls (no streaming audio capabilities), a six-speed automatic transmission, and SiriusXM Satellite Radio. 1LT: Between 2011 and 2016, the 1LT was the value-oriented Cruze model. It added the following equipment to the base LS: sixteen-inch aluminum-alloy wheels, SiriusXM Satellite Radio, cruise control, and the OnStar in-vehicle telematics system. Options included the 1.4L Turbocharged EcoTec Inline Four-Cylinder (I4) gasoline engine, a six-speed automatic transmission, Chevrolet MyLink seven-inch touch-screen infotainment system (2013+ models only), Bluetooth for hands-free telephone calls (no streaming audio capabilities) (later standard equipment in 2013+ models), a 290-watt premium amplified Pioneer audio system, a power-adjustable front driver's bucket seat, a power sunroof, a leather-wrapped steering wheel, and the RS Package. Eco: The Eco trim level, offered between 2011 and 2016 and based on the 1LT, was geared towards consumers who wanted a Cruze with higher fuel economy ratings. It added the following equipment to the 1LT: active front grille shutters, Bluetooth for hands-free telephone calls (no streaming audio capabilities- for 2011–2013 models only), Chevrolet MyLink touch-screen infotainment system (2013+ models only), a 1.4L Turbocharged EcoTec Inline Four-Cylinder (I4) gasoline engine, a power-adjustable front driver's bucket seat, a leather-wrapped steering wheel, and a rear-mounted spoiler. Additional options were identical to that of the 1LT, though the Eco also offered luxury leather-trimmed seating surfaces with dual heated front bucket seats as part of an optional package. 2LT: The 2LT trim level, offered between 2011 and 2016, added additional luxury and convenience features to the 1LT: a 1.4L Turbocharged EcoTec Inline Four-Cylinder (I4) gasoline engine, seventeen-inch aluminum-alloy wheels, Chevrolet MyLink seven-inch color touch-screen infotainment system (2013+ models only), luxury leather-trimmed seating surfaces with dual heated front bucket seats, a leather-wrapped steering wheel, power sunroof, and a security system. Options included a six-speed automatic transmission, a 290-watt premium amplified Pioneer audio system, side blind zone alert with rear cross-traffic alert (2014+ models only), the RS Package, and GPS navigation. LTZ: The LTZ trim level, offered between 2011 and 2016, was the top-of-the-line Cruze trim level. It added additional luxury features to the 2LT, such as: premium aluminum-alloy wheels, remote start, a six-speed automatic transmission, and a 290-watt premium amplified Pioneer audio system. Options included GPS navigation and the RS Package. Diesel: The Diesel was a diesel-powered version of the 2LT trim level of the Cruze, available for 2014 and 2015 only. It added unique seventeen-inch aluminum-alloy wheels, a six-speed automatic transmission, remote start, and a 2.0L Turbocharged Inline Four-Cylinder (I4) diesel engine to the 2LT trim level. Options were identical to that of the 2LT trim level, though the RS Package was not available on the Diesel. The car was launched and began production for South America in 2011. The new model was first announced for the Chinese market on the 2014 Beijing Auto Show and went on sale in August 2014. Based on the same platform as the Cruze J300, the Cruze J400 CN was essentially a reskinned old model, and only sold for 2 years before the release of the international Cruze J400. The four-door sedan has a fastback-like sloping roofline and a low drag coefficient of 0.28 comes with a choice of a 1.4 L (1,399 cc) turbocharged direct injection engine with a power of 110 kW (150 hp) at 5,600 rpm and torque of 235 N⋅m (173 lb⋅ft) at 1,600–4,000 rpm, which can be mated with a six-speed manual transmission or seven-speed Start/Stop enabled dual-clutch gearbox, or a 1.5 L (1,490 cc) direct injection engine with a power of 84 kW (113 hp) at 5,600 rpm and torque of 146 N⋅m (108 lb⋅ft) at 6,000 rpm mated to a six-speed Start/Stop-capable automatic transmission. Both engines come from the new GM Small Gasoline Engine family. Weight reduction of 10% is achieved by using very high-strength steels and aluminum alloys. Watt's link torsion beam rear suspension, first used on the Opel Astra (J), comes as standard. The car comes equipped with a 4.2" color screen radio or MyLink 2.0 infotainment system with an 8" screen, and can be configured with OnStar Gen10 offering 4G LTE Internet connection with a built-in Wi-Fi hotspot. The second-generation Cruze began sales in North America in early 2016, delayed a year by engineering changes. The Cruze has a new external design with a new split grille front and a fastback-like sloping roofline from the Chinese version of the fastback. This second generation Cruze has a slightly longer length and wheelbase than the one designed for the Chinese market, with different styling cues. It is also powered by the 1.4-liter turbocharged four-cylinder engine producing 153 hp (114 kW) and 177 lb⋅ft (240 N⋅m) torque. The 2016 Cruze comes equipped with both Apple CarPlay and Android Auto Capability features. However, only one of their phone brands at any one time can be used. In January 2016, Chevrolet unveiled the five-door hatchback version of the North American Cruze at the North American International Auto Show. It went on sale in late 2016 as a 2017 model. Trim levels continue to be L, LS, LT (now combined into one trim level, as opposed to the previous 1LT and 2LT designations), and Premier (replacing the previous LTZ trim level as the top-of-the-line Cruze trim level). Discontinued are the Eco and Diesel trim levels (at least for the time being). All trim levels include a seven-inch MyLink touch-screen infotainment system with A/M-F/M radio, USB integration, a 3.5-millimeter auxiliary audio input jack, optional SiriusXM satellite radio, voice control, and CarPlay and Android Auto capabilities, keyless entry, power windows, power door locks, OnStar with 4G/LTE/Wi-Fi Hotspot connectivity for multiple devices and RemoteLink via an app on the consumer's smartphone, air conditioning, and a 1.4-liter EcoTec inline-four engine. Higher trim levels (LT and Premier) also offer features such as the "RS Sport Package", alloy wheels, remote start, keyless access with push-button ignition, a premium sound system by Bose with external amplifier and subwoofer, an eight-inch MyLink infotainment system with GPS navigation, a power tilt-and-sliding sunroof, and power seats. However, only the top-of-the-line Premier trim level offers heated leather seating surfaces, premium alloy wheels, and other luxury features. The base L only offers a six-speed manual transmission, while the Premier, on the other end of the spectrum, offers only a six-speed automatic transmission. The LS and LT trim levels offer either a six-speed manual transmission, or a six-speed automatic transmission. A new diesel-powered Cruze will be available in 2017. It will have the 1.6L turbodiesel also found in the 2018 Equinox, paired to either a nine-speed automatic or six-speed manual transmission. Before launching the Chevrolet Cruze as the Holden Astra in Australia, Holden engineers performed 100,000 kilometres of suspension and steering testing at the Lang Lang Proving Ground south east of Melbourne, Australia, tuning for Australian roads. A firmer more compliant ride and more responsive steering tune is the result. Other major changes over the international model included revised front and rear bumpers, which aim to give it a similar look to the Holden Astra Hatch. Unlike the Hatch, the sedan is offered in LS, LS+, LT and LTZ trim levels. All models are powered by a 1.4 L (1,399 cc) turbocharged direct injection engine with a power of 110 kW (150 hp) at 5,600 rpm and torque of 235 N⋅m (173 lb⋅ft) at 1,600–4,000 rpm mated to a 6 speed manual or 6-speed automatic. For 2019, the Cruze received a mid-cycle facelift, which made its debut in April 2018, along with restyled versions of the 2019 Camaro, Spark, and Malibu. 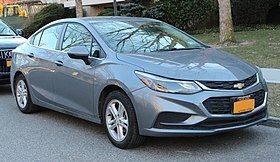 Changes for the Cruze for 2019 include the addition of a lower-priced LS model for the Cruze Hatchback, the deletion of the six-speed manual transmission option (all Cruze models, including the previous manual-only L, will come equipped with an automatic transmission), all-new third-generation Chevrolet MyLink Systems, and a revised RS Package for LT and Premier models. The 2019 Cruze went on sale in November 2018. Production of the Cruze in the US and Mexico ended in March 2019. The Lordstown assembly plant will be idled, while the Ramos Arizpe plant will build the Chevrolet Blazer instead. Production of the Cruze in Argentina and China will continue. Assembly of the Chevrolet Cruze Sedan at Lordstown Assembly in Lordstown, Ohio concluded on Wednesday, March 6, 2019, when the last car rolled off of the assembly line. Assembly plant workers at the plant wrote inspiring messages on the unfinished body underneath the paint, as well as signed one of the foam front seat cushions underneath the upholstery. Workers are hopeful that the plant will receive another General Motors (GM) product in the near future. Production of the Chevrolet Cruze Hatchback is due to end at Ramos Arizpe Assembly in Mexico, although the plant will continue to produce the all-new 2019 Chevrolet Blazer midsize SUV. GM turned down a offer from Cleveland automotive dealer owner Bernie Moreno to keep the plant open and continue building the Cruze under a five-year deal, which he hoped would be used to launch a ridesharing service featuring a fleet of Cruzes with two shifts under Moreno's direction. The deal fell through due to GM not being convinced it would be viable financially and the lack of public interests in sedans. Unlike its Chevrolet predecessors for the U.S. market- Cavalier, Prizm, and Cobalt- the Cruze has been discontinued without any announcement or plans for a replacement. 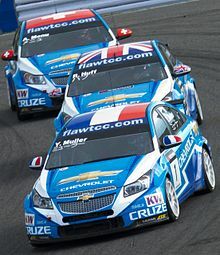 The Chevrolet Cruze first entered the World Touring Car Championship in 2009 with a 2.0-litre naturally aspirated engine, taking six wins in its debut season. The car has proved successful since its entry, with Yvan Muller winning the championship in 2010 and again in 2011 using the new 1.6-litre turbocharged engine. Chevrolet placed first, second and third in 2011, with Muller finishing ahead of teammates Rob Huff and Alain Menu. Chevrolet finished 1–2–3 again in 2012, this time, Huff becoming champion ahead of Menu and Muller. The Cruze also entered the British Touring Car Championship for 2010 and 2011. Jason Plato won the championship for Chevrolet in 2010 and finished 3rd in 2011. The BTCC Cruze used the 2.0-liter naturally aspirated engine found in the original variant of the WTCC Cruze. The Cruze won the Scandinavian Touring Car Championship in 2011, being run by NIKA Racing under the banner of 'Chevrolet Motorsport Sweden' with Rickard Rydell driving. Rydell and teammate Michel Nykjær finished second and third in 2012. Chevrolet pulled their sponsorship at the end of 2011 from the BTCC to support the Chevrolet team in the World Touring Car Championship for 2012. Chevrolet then announced they would not enter a works team for the 2013 WTCC season. For 2013 RML, the original builders of the Cruzes, continued to compete without the support of Chevrolet. Cars were also entered by Bamboo Engineering, NIKA Racing and Tuenti Racing Team. Despite no funding from the manufacturer, the Cruze remained the car to beat, even against works teams from Honda and Lada. Muller won his fourth WTCC title, his third in a Cruze and James Nash won the Yokohama Drivers' Trophy for independent entries, ahead of fellow Cruze drivers Alex MacDowall and Michel Nykjær. RML have confirmed they will build Cruzes to the new set of WTCC regulations for 2014, which sees the cars increase in power and feature greater aerodynamics. RML aim to build up to six cars. Confirmed recipients include Tom Chilton who has yet to announce a team to run his car, Bamboo Engineering who will run two cars and Campos Racing who will enter a car for Hugo Valente. The Cruze returned to the BTCC in 2013 in the hands of Joe Girling and Tech-Speed Motorsport, who loaned the car from Finesse Motorsport. The increase in performance of the Next Generation Touring Car entries meant the older Super 2000 specification cars like the Cruze were now too uncompetitive to compete for wins but were provided with their own category. Now running a 2.0-litre turbocharged NGTC-specification engine, Girling took one class win at Donington Park but missed the second half of the season. The car returned to Finesse Motorsport who entered the Knockhill round of the championship with Aiden Moffat driving. At sixteen years old, Moffat became the BTCC's youngest driver at 16 years, 10 months and 28 days. This was to be the S2000 Cruze's final appearance in the BTCC, as S2000 cars are to be abolished from 2014. Andy Neate entered the 2013 season with a new NGTC-specification Cruze, built by his own team, IP Tech Race Engineering and used an engine built by RML. The car made its debut at Snetterton and competed at several rounds towards the end of the season. The car has since been sold to Aiden Moffat, who will run the car with his own team for 2014. BTC Racing will enter a hatchback variant of the Cruze for 2014, driven by Chris Stockton. The car was originally intended to be used by Jason Plato in 2012 but RML and Chevrolet withdrew from the BTCC and mothballed the shell. BTC Racing acquired it and were initially included on the entry list for 2013 but the car was not finished in time and never appeared all season. The first-generation Chevrolet Cruze debuted in the Argentine TC 2000 in 2011, and the second-generation in 2016. Agustín Canapino won the 2016 championship. The Cruze diesel was the first GM passenger car equipped with a diesel engine in the American market in 28 years; however, sales were weaker than expected being 2% of Cruze models sold July through June of 2014. In August 2014, Cruze sales reached the milestone of 3 million units sold worldwide, 16 months after passing the 2 million mark. The following table shows the top selling markets as of August 2014[update]. By April 2016 cumulative sales of cars of the Cruze name exceeded 4 million worldwide. ^ "GM's recalled Cobalt was a failure from the start". CNN. April 21, 2014. Retrieved December 2, 2018. ^ a b Newton, Bruce (December 19, 2001). "Cruze price bruise". GoAuto. John Mellor. Archived from the original on October 5, 2009. Retrieved May 20, 2009. ^ Newton, Bruce (September 6, 2000). "Suzuki acts swiftly on Ignis debut". GoAuto. John Mellor. Archived from the original on October 18, 2009. Retrieved May 20, 2009. ^ Newton, Bruce (October 11, 2002). "Car review – Holden Cruze 5-dr wagon". GoAuto. John Mellor. Retrieved May 20, 2009. ^ "Design By Holden, Engineering By Suzuki, Badge By Chevrolet". AutoWeb. Web Publications. October 19, 1999. Retrieved May 20, 2009. ^ "GM returns to Japan manufacturing". USA Today. October 22, 2001. Retrieved May 22, 2009. ^ a b "GM introduces the "Cruze" compact lifestyle vehicle, jointly developed by GM, Suzuki". General Motors. October 22, 2001. Retrieved May 22, 2009. ^ "Holden Cruze (YG Cruze)". GoAuto. John Mellor. Archived from the original on October 5, 2009. Retrieved November 19, 2009. ^ a b "Suzuki Introduces Ignis". AutoWeb. Web Publications. October 25, 2000. Archived from the original on July 6, 2011. Retrieved November 19, 2009. ^ Newton, Bruce; Pettendy, Marton (June 5, 2002). "First drive: Holden's Cruze is hot to tot". GoAuto. John Mellor. Retrieved June 23, 2012. ^ "Suzuki Ignis (2003–) Review". Channel 4. Archived from the original on October 28, 2007. Retrieved May 22, 2009. 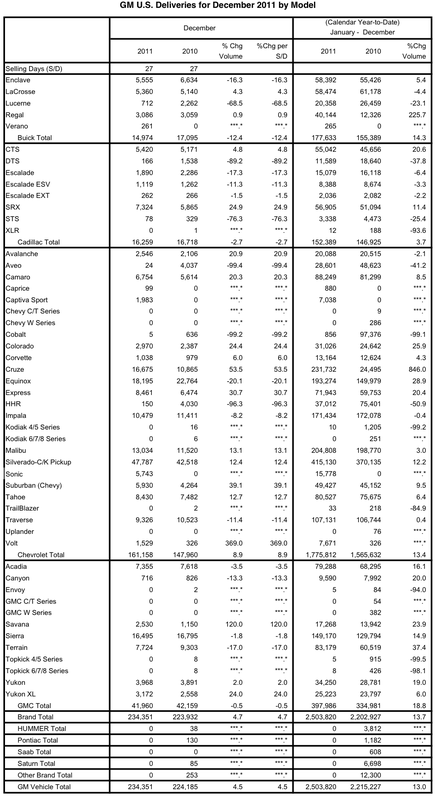 ^ a b c d e f "GM Powertrain USA Information Guide Model Year 2014" (PDF). General Motors. Retrieved November 19, 2013. ^ a b Davis, Matt (April 1, 2009). "2011 Chevrolet Cruze First Drive". Edmunds. Retrieved July 5, 2009. ^ Arnold, Mark (July 15, 2008). "2010 Chevy Cruze: Rick Wagoner Unwraps First Shots Of Chevy Cruze, Cadillac SRX". Jalopnik. Retrieved August 23, 2008. ^ Neff, John (August 21, 2008). "GM releases official pics of 2011 Chevy Cruze". Autoblog. Retrieved December 13, 2013. ^ a b c d Mathioudakis, Bryon (February 28, 2011). "Holden's Australian-built Cruze surfaces". GoAuto. John Mellor. Retrieved March 4, 2011. ^ Courtenay, Vince (February 27, 2009). "First Korean-Built Chevy Cruze Shipment Sails for Europe". Ward's Auto. Archived from the original on August 11, 2011. ^ Lienart, Paul (December 12, 2008). "Running Out of Cash at Home, GM Opens Another China Plant". Edmunds. Retrieved December 19, 2008. ^ a b Gurgaon, Haryana (July 13, 2009). "GM India part of the New General Motors Company". India PRWire. Retrieved August 7, 2009. ^ "The new Chevrolet Cruze – Change the rules". Gami Group. April 19, 2009. Archived from the original on August 18, 2011. ^ Ellison, Edd (November 15, 2010). "Vietnam Gearing Up for Rapid Auto Industry Growth". Ward's Auto. Archived from the original on August 18, 2011. ^ "Company/Plant History". Azia Avto. Archived from the original on January 16, 2011. Retrieved October 21, 2010. ^ Santivimolnat, Santan (November 24, 2010). "Chevrolet expects lift from Cruze". Bangkok Post. Retrieved March 5, 2011. ^ "Cruze vai substituir Astra e Vectra GT até ano que vem" [Cruze to replace Astra and Vectra GT next year]. Diário de Marília (in Portuguese). March 5, 2011. Archived from the original on March 7, 2011. Retrieved April 1, 2010. ^ "GM to Spend $500 Million to Launch the Chevy Cruze, a New Small Car". United States Department of Energy. August 27, 2008. Archived from the original on September 4, 2008. Retrieved September 4, 2008. ^ a b Bunkley, Nick (September 9, 2010). "G.M. Makes a Play for Buyers and Investors". The New York Times. Retrieved September 9, 2010. ^ Lienert, Paul (July 8, 2008). "2011 Chevrolet Cruze – Car News". Car and Driver. Retrieved July 8, 2010. ^ Courtenay, Vince (February 27, 2009). "First Korean-Built Chevy Cruze Shipment Sails for Europe". Ward's. Retrieved June 2, 2012. ^ Muller, Joann (June 3, 2009). "GM's Global Strategy in Doubt". Forbes. Retrieved May 28, 2012. ^ "Chevrolet Takes Center Stage in Korea". General Motors. January 19, 2011. Retrieved May 28, 2012. ^ a b c d Mathioudakis, Bryon (May 19, 2009). "Holden Cruze set at $20,990". GoAuto. John Mellor. Retrieved May 20, 2009. ^ a b Pettendy, Marton (February 27, 2009). "Melbourne show: Holden comes clean on Cruze". GoAuto. John Mellor. Retrieved February 27, 2009. ^ O'Kane, Tony (July 23, 2010). "Holden Cruze CDX Diesel Review". The Motor Report. Retrieved January 16, 2010. ^ Colias, Mike (May 9, 2016). "GM learns to exploit its scale". Automotive News. Retrieved May 9, 2016. ^ Papworth, Andrew (October 1, 2010). "Paris motor show: Chevrolet Cruze hatch". Autocar. Retrieved October 6, 2010. ^ Wood, Colum (October 1, 2010). "Chevy Cruze Hatchback Unveiled for Europe [Paris 2010]". AutoGuide. VerticalScope. Retrieved October 6, 2010. ^ Gover, Paul (September 10, 2010). "Holden Cruze 2011 our global star". Herald Sun. Retrieved October 6, 2010. ^ Nunez, Alex. "Chevrolet Cruze station wagon unveiled ahead of Geneva". Autoblog. ^ Blackburn, Blackburn (May 11, 2009). "Holden's new Cruze scores five stars for safety". Drive. Retrieved May 11, 2009. ^ "Chevrolet Cruze gets 5-star safety rating in China". Gasgoo. July 2, 2009. Retrieved August 18, 2009. ^ Hughes, Steve (November 26, 2009). "Safety success for Astra and Cruze". Ayrshire Post. Scottish & Universal Newspapers. Archived from the original on November 30, 2009. Retrieved November 28, 2009. ^ "Lacetti Premiere Receives Maximum Five-Star Rating from KNCAP". Korea Newswire. December 11, 2009. Retrieved December 16, 2009. ^ "Chevrolet Cruze". Insurance Institute for Highway Safety. Archived from the original on December 30, 2010. Retrieved January 6, 2011. ^ "2011 Chevrolet Cruze". National Highway Traffic Safety Administration. Retrieved January 6, 2011. ^ Welsh, Jonathan (April 10, 2011). "Chevy Recalls Cruze After A Steering Wheel Falls Off". The Wall Street Journal. Retrieved April 11, 2011. ^ Jensen, Cheryl (October 26, 2011). "Some Losers in Consumer Reports Reliability Survey Are Winners in Showrooms". The New York Times. Retrieved October 28, 2011. ^ "GM recalls 475,418 Chevy Cruze for engine shield". Reuters. Retrieved June 22, 2012. ^ "Cruze recall due to engine fire danger". ABC Online. Australian Broadcasting Corporation. June 27, 2012. Retrieved June 27, 2012. ^ Calia, Michael (August 16, 2013). "GM to Recall Nearly 300,000 Chevy Cruze Models From 2011, 2012". The Wall Street Journal. Retrieved September 5, 2013. ^ "GM issues stop-delivery order on some 2013–14 Chevrolet Cruze compacts". ^ "GM recalls Chevy Cruze for axle problem". ^ Khan, Faisal. "2013 Chevrolet Cruze Facelift Unveiled". MotorBeam. Archived from the original on December 25, 2012. Retrieved December 15, 2012. ^ "2013 Chevrolet Cruze Facelift Launched in Malaysia". autoevolution, SoftNews NET. Retrieved December 15, 2012. ^ Suttle, Alisdair (April 19, 2009). "Chevy goes Cruze-ing". Daily Express. Northern and Shell Media. Retrieved May 21, 2009. ^ "Chevrolet Cruze: Viva La Holden". Web Wombat. September 1, 2008. Retrieved May 21, 2009. ^ Stevens, Samantha (February 27, 2009). "2009 Melbourne show – Holden Cruze". Wheels magazine. Archived from the original on September 18, 2009. Retrieved May 21, 2009. ^ a b Gillies, Mark (April 2010). "2011 Chevrolet Cruze U.S. Spec – First Drive Review". Car and Driver. Retrieved January 10, 2011. ^ Pettendy, Marton (March 31, 2009). "Inside Holden's Delta force". GoAuto. John Mellor. Retrieved May 21, 2009. ^ Lord, Brad (July 26, 2011). "2011 Chevrolet Cruze Diesel First Drive". Edmunds Inside Line. Edmunds Inc. Retrieved January 7, 2012. ^ "There's Tom and Penny – now meet Chevy Cruze". Motoring & Independent Online. September 23, 2009. Retrieved October 4, 2009. ^ Hyun-cheol, Kim (October 29, 2008). "Small Is Beautiful in Lean Times". The Korea Times. Retrieved May 23, 2009. ^ Courtenay, Vince (January 20, 2011). "Daewoo Bowing Out as Brand, Company Name in Korea". WardsAuto. Archived from the original on June 6, 2011. ^ Seo, Sookyung; Trudell, Craig (January 20, 2011). "GM Drops Daewoo Brand for Chevrolet in South Korea". Bloomberg Businessweek. Archived from the original on June 6, 2011. ^ "Chevrolet offers free replacement of the emblem for Lacetti owerners". Maeil Kyungje. January 24, 2011. Retrieved April 11, 2012. ^ Gao, George (March 30, 2009). "Chevrolet Cruze to hit China market on Apr. 18 – China automotive news". Gasgoo. Retrieved June 6, 2009. ^ "GM India expects 50% growth in 2010". Business Standard. September 24, 2009. Retrieved October 7, 2009. ^ "GM India Launches Chevrolet Cruze". MotorBeam. October 12, 2009. Retrieved December 13, 2013. ^ Chong, Elizabeth (May 11, 2009). "Cruze-ing along Targeted sales of 600 units of Chevrolet's new model". The Star. Star Publications. Retrieved May 20, 2009. ^ Kouider, Hossine (April 6, 2010). "Naza to sell Chevrolets". The Star. Star Publications. Retrieved April 6, 2010. ^ Hagon, Toby (February 27, 2009). "Holden Cruze missiles to Australia". Drive. Archived from the original on July 22, 2011. Retrieved January 12, 2014. ^ Gover, Paul (May 17, 2009). "Holden Cruze must succeed". Herald Sun. Archived from the original on October 2, 2009. Retrieved June 9, 2009. ^ Toby, Hagon (May 19, 2009). "Holden set to abandon Astra". Drive. Retrieved July 10, 2010. ^ Pettendy, Marton (August 31, 2009). "European Astra skips Australia". GoAuto. John Mellor. Retrieved November 19, 2009. ^ Ottley, Stephen (July 8, 2009). "Holden goes Cruze-ing". Carsales. Archived from the original on July 6, 2011. Retrieved February 27, 2009. ^ Ottley, Stephen (February 27, 2009). "Holden Cruze CDX". Carsales. Archived from the original on August 22, 2009. Retrieved August 7, 2009. ^ "Holden expands Cruze line-up". Carsales. October 8, 2009. Archived from the original on October 11, 2009. Retrieved October 8, 2009. ^ Maetzig, Rob (August 24, 2010). "Cruze gets high-spec diesel". Taranaki Daily News. Retrieved March 19, 2011. ^ "GM Holden recalls 9,000 cars over faulty fuel hose". Agence France-Presse. March 18, 2010. Retrieved March 19, 2010. ^ Hammerton, Ron (March 11, 2010). "Holden quarantines Cruze". GoAuto. John Mellor. Archived from the original on March 15, 2010. Retrieved March 19, 2010. ^ a b c d e Mellor, John; Pettendy, Marton (December 22, 2008). "Holden to build all-new small car from 2010". GoAuto. John Mellor. Retrieved December 23, 2008. ^ Pettendy, Marton (October 8, 2009). "Holden heralds top-spec Cruze diesel". GoAuto. John Mellor. Retrieved October 8, 2009. ^ Stanford, James (January 12, 2010). "Holden confirms Cruze delay". GoAuto. John Mellor. Retrieved April 16, 2010. ^ Blackburn, Richard; Hagon, Toby (June 3, 2009). "Holden confirms it will design and engineer a new hatch". Drive. Retrieved March 4, 2011. ^ Blackburn, Richard; Hagon, Toby (December 22, 2008). "Holden to build small four-cylinder car". Drive. Retrieved December 23, 2008. ^ a b c d Gover, Tim; Beissmann, Kevin (February 28, 2011). "Holden Cruze Series II on sale late-March". Car Advice. Retrieved February 28, 2011. ^ a b Mathioudakis, Bryon (March 18, 2011). "First drive: Holden Cruze reboots Aussie small-car era". GoAuto. John Mellor. Retrieved March 19, 2011. ^ Colquhoun, Steve (February 28, 2011). "Local Cruze still an import". GoAuto. John Mellor. Retrieved March 5, 2011. ^ Mathioudakis, Bryon (March 1, 2011). "Oz Cruze diverges from global model". GoAuto. John Mellor. Retrieved March 5, 2011. ^ a b c d "2011 Holden Cruze Series II Sedan Revealed". The Motor Report. February 28, 2011. Retrieved March 4, 2011. ^ a b Colquhoun, Steve (February 28, 2011). "Holden Cruze to lead fuel economy way". Drive. Retrieved March 4, 2011. ^ a b c d "2011 Holden Cruze SRi And SRi-V Revealed". The Motor Report. February 28, 2011. Retrieved March 4, 2011. ^ Pettendy, Marton (September 6, 2011). "Holden heralds MY12 Cruze". GoAuto. John Mellor. Retrieved September 18, 2011. ^ Stevens, Mike (July 11, 2016). "Holden Cruze production to end October 7, ahead of new Astra debut". CarAdvice. Retrieved July 11, 2016. ^ "Chevrolet Cruze Hatchback (2011–2015) Driving & Performance – Parkers". www.parkers.co.uk. ^ "Contacto: Chevrolet Cruze" (in Spanish). Terra Networks México. July 23, 2009. Archived from the original on July 30, 2009. Retrieved November 19, 2009. ^ Silverio, Ricardo (September 10, 2009). "Chevrolet Cruze 2010 un nuevo producto para México" (in Spanish). Autocosmos. Archived from the original on July 22, 2011. Retrieved November 19, 2009. ^ Snell, Robert (October 29, 2009). "Launch of GM's Cruze delayed 3 months". The Detroit News. Retrieved October 30, 2009. ^ Bunkley, Nick (September 8, 2010). "G.M. Makes a Play for Buyers and Investors". The New York Times. Retrieved September 9, 2010. ^ Mathioudakis, Bryon (December 7, 2009). "Pretty Cruze hatch might miss US". GoAuto. John Mellor. Retrieved December 9, 2009. ^ a b Ireson, Nelson (November 29, 2009). "2011 Chevrolet Cruze Revealed Ahead of LA Auto Show Debut". MotorAuthority. High Gear Media. Retrieved November 30, 2009. ^ Diehlman, Steve (August 31, 2010). "Cruising Cruze: 2011 Chevrolet Cruze Gets EPA Certified, Capable of 36 MPG". Motor Trend. Source Interlink Media. Retrieved September 2, 2010. ^ Wint, Bradley (August 12, 2010). "Chevrolet Cruze Eco's Air Shutter helps achieve 40 MPG". Motorthusiast. Archived from the original on August 15, 2010. Retrieved August 12, 2010. ^ Stewart, Ben (February 4, 2011). "2011 Chevrolet Cruze Eco Test Drive". Popular Mechanics. Hearst Communications. Retrieved June 4, 2011. ^ Martin, Terry (November 30, 2009). "American Cruze packs in performance, safety". GoAuto. John Mellor. Retrieved December 9, 2009. ^ Bloxam, Kelsea (April 28, 2009). "GM says Pontiac hit a dead end". Metro Vancouver. Archived from the original on June 4, 2011. Retrieved May 1, 2009. ^ Krisher, Tom (July 8, 2009). "GM retooling Ohio factory for small-car success". Sun Journal. Retrieved August 24, 2009. ^ Schoenberger, Robert (June 3, 2010). "GM taking some unusual risks in bringing its Chevrolet Cruze small car to market". The Plain Dealer. Advance Publications. Retrieved June 22, 2010. ^ "2012 Chevrolet Cruze Review and Road Test". Archived from the original on June 17, 2012. Retrieved May 18, 2012. ^ "Face-Off: Chevy Cruze Diesel vs. VW Jetta TDI". Automoblog.net. April 22, 2013. Retrieved May 13, 2013. ^ "Cruze Clean Turbo Diesel Delivers Efficient Performance". February 7, 2013. Retrieved August 5, 2013. ^ a b "Chevy Cruze Diesel Sales: Mediocre At Best, So Far". ^ "GM China Milestones in 2014". GMC Pressroom (Press release). January 6, 2015. Retrieved October 21, 2016. ^ "Oficializaran en Ramos el nuevo Cruze". El Diario de Coahuila. April 10, 2016. Retrieved May 23, 2016. ^ "Chevrolet presenta el nuevo Cruze". Asteriscos.Tv. May 5, 2016. Retrieved May 23, 2016. ^ Accardi, Michael (April 22, 2016). "The 2016 Cruze is More Than a Competent Compact from Chevrolet". GMInsideNews. Retrieved September 5, 2016. ^ "GM D2XX Vehicle Platform". GM Authority. Retrieved May 26, 2016. ^ a b c d "Sophisticated Sophomore: All-New 2016 Chevrolet Cruze". ^ "Exclusive: GM delays Chevy Cruze debut by a year – sources". July 17, 2013 – via Reuters. ^ Gardner, Daniel (January 8, 2016). "Detroit show: Chevrolet Cruze hatch unveiled". GoAuto. Retrieved January 10, 2016. ^ "Chevrolet Pressroom – United States – Cruze". ^ "GM will take aim at VW with diesel Chevy Cruze". ^ a b "Holden Pressroom – Australia – Astra Sedan". media.gm.com. General Motors. Retrieved June 4, 2018. ^ Bomey, Nathan (November 26, 2018). "GM to kill Chevrolet Volt, Cruze, Impala as Americans ditch passenger cars". Detroit Free Press. Retrieved November 26, 2018. ^ Centeno, Deivis (November 28, 2018). "GM To Also End Chevy Cruze Production In Mexico". GM Authority. Retrieved November 28, 2018. ^ "WTCC 2011 Chevrolet Cruze 1.6 turbo". AutomobileReviews.com. March 14, 2011. Retrieved October 3, 2011. ^ Dumitrache, Alina (March 23, 2010). "Chevrolet Cruze to Enter 2010 BTCC". ^ "Source: Fenabrave". Archived from the original on August 18, 2000. ^ Hammerton, Ron (January 8, 2010). "Adelaide-built Holden Commodore best-selling car 15 years in a row". The Advertiser. Retrieved January 6, 2011. ^ Foley, Hua (January 4, 2010). "GM Sales in China Jump 66.9% in 2009 to All-Time High, Continue to Lead the Industry". General Motors. Archived from the original on December 20, 2010. Retrieved March 19, 2011. ^ Martin, Stuart (January 6, 2011). "VFACTS: Cars lose more ground to SUVs, LCVs". GoAuto. John Mellor. Retrieved January 6, 2011. ^ "General Motors Sets New Sales Record in China in 2010" (Press release). General Motors. January 4, 2010. Retrieved December 2, 2018. ^ "General Motors 2010 Calendar Year Sales Up 21 Percent; December Sales Increase 16 Percent – Best Month of 2010" (Press release). General Motors. January 4, 2011. Retrieved December 2, 2018. ^ "One million new cars for 2011". Drive. January 5, 2012. Retrieved May 27, 2012. ^ "General Motors Sets Sales Record in China in 2011". ^ "General Motors 2011 Calendar Year Sales". ^ "Car sales 2012: Small cars dominant at the top – CarAdvice". ^ "General Motors Has Another Record Year in China". ^ "GM 2012 Sales: Chevrolet Silverado, Volt End Strong – GM Sells One Million 30-MPG Cars". January 3, 2013. ^ "Car sales 2013 : Toyota Corolla steals title of Australia's most popular car – CarAdvice". ^ "GM U.S. Deliveries for December 2013" (PDF). General Motors. January 3, 2014. Retrieved January 6, 2014. ^ "General Motors Sets Sales Records in China". ^ a b Philippe Crowe (August 29, 2014). "3 Million Cruze Sedans Sold Worldwide". HybridCars.com. Retrieved August 31, 2014. ^ "2016 Chevrolet Cruze Offers 42 MPG on the Highway" (Press release). Detroit, Michigan. April 18, 2016. Archived from the original on July 4, 2017. Retrieved January 13, 2019. Wikimedia Commons has media related to Chevrolet Cruze.